constructed with timber from Essex and East Anglia using the carvel shipbuilding process - a technique that used fewer materials than others employed at that time, and which made ships cheaper to produce. By 1545, all merchant and warships built on the Thames were made in this style. This popular technique created a smooth hull by attaching wooden planks flush next to each other. This made ships stronger, more spacious, more streamlined and faster. The various sections were joined together with 'tree nails' - wooden plugs, which have kept the sections together to this day, more than 430 years later. 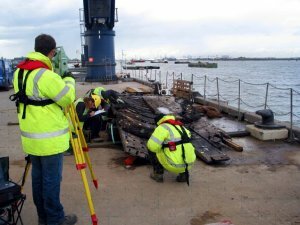 The vessel shows evidence of both large and small repairs suggesting it is likely to have had a long working life before the incident which led to its final sinking. No human remains were found and the reason for its sinking remains a mystery - although it is well known that the Thames Estuary was always difficult to navigate and it is possible that The Gresham Ship could have run aground. Shifting sandbanks and swift currents were a large part of the problem. The area was not charted as it is today, and there was a total reliance on local pilots or the crew's own knowledge. There was no port authority controlling shipping movements and providing up-to-date information on safe navigation as the Port of London Authority does now. It is possible that this ship stranded on one of the estuary sandbanks on a falling tide, was damaged and foundered. 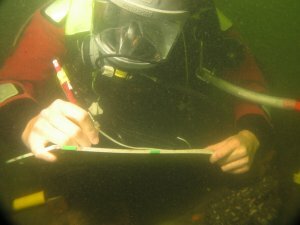 The underwater archaeologists from the University of Southern Denmark have studied the wreck as part of a research programme - diving on the remains in Horsea Lake.Images from the studies are available here (2007) and here (2008) - both open in a new window.